TPCL- Perhaps we can help ? How to effectively manage human resources has become the key challenge for any leader, not only in terms of his ability to compete, but to survive. The dizzying rate of change and the accompanying demands and complexity of today’s business environment have had a tremendous impact on the Indian corporate sector, and the way they were being managed. Although Technology received the maximum attention, the only sustainable competitive advantage in today's environment are People. How to effectively manage human resources has become the key challenge for the leader, not only in terms of his ability to compete, but to survive. When formalized training and development is required to implement your business goals, Team Productivity Consultants offer an Indian experience of having trained more than 185,000 delegates of over 200 Blue Chip Indian corporations. TPCL is a pioneer in soft skill training in India.The business was started in 1985. Established offices across India. TPCL trained people in India, Malaysia, Singapore, Indonesia, Nepal, Saudi Arabia, Bahrain, Dubai, Mauritius, Sri Lanka and Philippines. 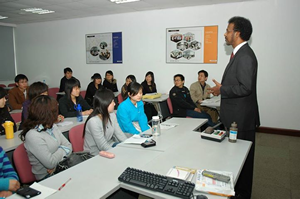 At TPCL, we recognize your need to understand and effectively develop people who would be the key to build the 21st Century Corporation and as a part of integrated human resources development, we offer training and consulting to help you develop effective training solutions linked to your corporate strategy and business goals. TPCL brings you an extensive range of training programs which are built around principles proven in the real world of business and guarantee results oriented training that will transform your business. What Does TPCL Do for you? Training programs offered by TPCL provide your organization with unsurpassed quality and unmatched flexibility. C-1, 527, Scottish Tower, Palam Vihar, Gurgaon, Haryana, INDIA All rights resevred. @ 2013. TPCL.